There are four basic steps involved in becoming a pet therapy team with NCTD. While the process may seem intense, and perhaps even a bit daunting, it is necessary to train each team on how to handle various situations that may arise while volunteering. We work closely with you and your pet in order to set you up for success and to help ensure a fun and rewarding volunteer experience. Your dog must have passed the AKC Canine Good Citizen test which highlights the most basic of obedience skills. 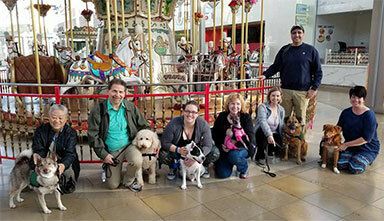 Prior to undergoing the Therapy Dog Evaluation, new volunteer teams are required to take the Handler's Class and the Therapy Dog Training Class (TDTC). Dogs must have lived with you for at least six months and be at least 10 months old to begin Therapy Dog Training Classes, and 1 year old to take the Evaluation. Dogs need to be in good health, be current with their rabies vaccine and have a health form filled out by their veterinarian. A copy of current rabies vaccination must be provided by the first day of class. Generally, NCTD sponsors training and evaluation for new volunteers in the Baltimore-Washington area approximately four times each year. Because our volunteers come from a wide area, classes are held in various locations (usually Howard or Montgomery County MD) to allow for easier access for participants. Early registration is always appreciated as our classes can fill up quickly. Dates and times for our classes and evaluations can be found on the Calendar of Events. Selectng the desired event will take you to the online registration page where you can also make a secure payment through PayPal. Alternatively, you can print and fill out the NCTD Registration Form, and mail it to us with a check. Please refer to the Contact Us page for the relevant street address to use. Note that paper registration forms may not be reviewed and acknowledged until shortly before the event. Until then, assume you are registered. Please direct any questions pertaining to classes or evaluations to the Director of Training on our Leadership Team. This one day intensive training class for prospective therapy animal handlers is taught by trained NCTD instructors. The class features lecture and PowerPoint presentations, class discussion, role play, demonstration, and videos. It will cover topics such as therapy animal team registration requirements, different health care settings and populations, visiting tips and techniques, and managing stress and difficult situations. The fee for this course includes a resource guide, which will be distributed at the class. A copy of your dog's current rabies certificate and AKC Canine Good Citizen certification is required. Sorry, no pets allowed at this class. Light refreshments and/or lunch will be provided, depending on class times. A minimum of 5 students are required to offer this training; class size is limited to 15 people. Registrations are accepted up to one week before class is held. All fees must be received prior to attending this class and are non-refundable. Get to know more about NCTD. Meet other NCTD volunteers, and learn from their visiting experiences. Become prepared for therapy visits. Get your pet exposed to hospital equipment. Improve control and communication with your pet. Practice team reaction to distractions. Practice with successful therapy animals. Teams must attend 5 out of 6 classes to be eligible for evaluation. The sixth class is generally a "mall visit" to practice visiting skills in a public setting. After training, NCTD will perform an evaluation to determine if you and your animal are ready to start visiting. Note that this is a different event from your training classes and you must register in advance for an evaluation. Team evaluations are performed by NCTD Team Evaluators. Your evaluator will be looking for reliable and predictable volunteer teams who will inspire confidence in clients. In the evaluation, you and your animal will demonstrate that you are able to work as team, that your animal is under control, and that you and your animal are friendly and relate well to the role players and evaluator. All of these skills are described and practiced during the NCTD training classes. A copy of the animal's current rabies certificate (a rabies tag is not acceptable). If you are not owner of the animal, we require a note from the owner granting permission for you to work with the animal. Animal treats (if animal has special dietary needs). Towel (for small animal tests). Your animal must be on an acceptable collar/lead at all times. The use of prong, pinch, choke, or electronic/shock collars are prohibited. Flexi Leashes or chain leads are not allowed. You will be required to sign an indemnity form when you come to the evaluation site. The team (Volunteer/Pet) should present themselves as if they were going on a therapy visit. The evaluation begins when you arrive on the premises and ends when you leave. The person who will work with the animal must accompany it during the evaluation. The evaluation may be stopped or cancelled if the volunteer or animal appears to be too stressed or if they behave inappropriately during the evaluation or on the premises. Dogs, cats and birds must be at least one year of age (please inquire about rabbits). Pets must be restrained by leash, harness, carrier, or other appropriate manner at all times, including birds. If your pet is on antibiotics, in season (documentation required), or otherwise doesn't feel its best, please reschedule to have your pet evaluated another day (and please notify NCTD if unable to attend at last minute due to the above reasons). A pet will not be evaluated more than once in the same day if it is unable to complete the evaluation as specified. NO inhumane treatment of pets will be allowed. The evaluation facilities are accessible for those who have disabilities. Rescheduled evaluations will be given if the volunteer is ill.
No refunds will be given for teams that do not pass the evaluation. Teams that pass the team evaluation and wish to work with NCTD will be assigned a mentor as part of NCTD's mentor program. When you pass the NCTD evaluation, you may register as an NCTD Volunteer Team immediately if you bring your completed veterinary form (the NCTD Health Status Report) with you. You will receive an acceptance letter and an ID photo will be taken. If you do not have your veterinary form, you will be given the address to send it to. When we receive everything, you will be added to our volunteer roster and to our E-mail mailing list. NCTD volunteers enjoy access to additional sections of the NCTD website, the ability to purchase NCTD gear, and special members-only events. We communicate with our volunteers through a combination of group e-mail messages, web site information, and our e-newsletter. When you visit on behalf of NCTD, you must have an acceptable collar and leash for your animal, as well as the "NCTD Photo ID", which you will receive after you pass the team evaluation. NCTD also asks that handlers purchase a shirt with the NCTD logo through Land’s End. (We will give you the needed ordering information when you pass your team evaluation.) While not required, NCTD attire helps us maintain a professional image. Otherwise, be neat, clean, and comfortable. Please note that in some cases, an individual facility may have their own specific dress requirements. Many require that we wear a shirt with the NCTD logo. Others may have general restrictions such as no jeans or shorts. So be sure to ask about it when applying to a facility. You can find a list of NCTD-approved facilities on the Facility Directory page. If you already know the facility you want to visit, you may contact the NCTD Facility Coordinator for that site directly. As you consider various facilities, you should know that some have specific requirement for volunteers. These may include things such as pre-screening, volunteer training, background checks, medical tests, or flu shots. Information on specific volunteer requirements is usually on the facility's website or available through their Volunteer office. The NCTD facility coordinator for that facility can also help you with this. Don’t know where to start? Contact the Regional Director in your area and we will help you find a suitable placement. You can find those contacts on the NCTD Leadership Team list. With NCTD's variety of facilities, feel free to pre-visit as many facilities as you wish to find the facility that best suits your team's needs. We recommend you start by visiting with your animal at only one facility and expand from there. Your first official visit at a facility will be one where you shadow and observe your mentor with her/his pet partner. On the next visit, your mentor will leave her/his animal at home and observe you on a visit with your animal. Your mentor can provide valuable feedback! If needed or requested, by you or the mentor, your mentor can observe you for additional visits. Congratulations! It has been a lot of work for you and your animal partner, but you are now ready to start visiting on a regular basis. Attend at least one NCTD Open Floor event or other approved training opportunity every calendar year. Maintain your NCTD registration. Re-registration is required every three years. Volunteer at one NCTD event each year. Have your Facility Performance Review Forms completed annually. Check your E-mail and the NCTD web site regularly for important information.